Dark Souls 3’s New Expansion, The Ringed City now has a release date and a trailer. From Software’s infuriatingly addictive RPG, Darks Souls 3, will be receiving its second and final expansion. This DLC is tilted The Ringed City which will be available for players on March 28th for PlayStation 4, Xbox One, and PC. You can view the official trailer for The Ringed City down below. The first Dark Souls 3 DLC was a hit with the community with its only downside being that the Journey was quite short. We hope to see that this new DLC will be lengthy and go out with a bang. The Official description for the new expansions reads as so,” This new adventure has players chasing after the Slave Knight Gael to the literal end of the world as he searches for the Dark Soul of Humanity.” If this doesn’t get your blood running I don’t know what will. It seems that players will be and the hunt to stop this knight from destroy all of humanity. The Ringed City will also be introducing a new type of enemy, “ ancient beasts” as well as characters on the brink of insanity. Like any other DLC New armor, weapons, and magic will be introduced. 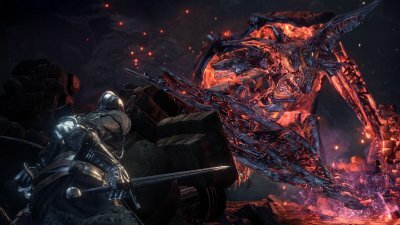 Publisher Bandai Namco describes The Ringed City as a place “ filled with new horrors for players to overcome. In tradition to any of the dark souls games or DLC expect for these challenges to bend you to their will as you struggle to handle whatever the game has to throw at you. The Ringed City will priced by itself at $15 or you can purchase the season pass for $25 which will come with both the 1st expansion and the 2nd Expansion. This DLC sounds like it’s going to be the toughest one yet, players are going to be exploring beautifully destroyed landscapes as they face the horrors of what's to come. It will interesting to see what nail biting encounters and massive beasts are to come as players take on the Slave Knight Gael. Let us know about what you think about The Ringed City in the comments below.